For the world’s largest pork producer, simply selling bacon and ham no longer feels like enough to drive growth. That’s why Smithfield Foods Inc. is shaking up management and refocusing its business to meet the needs of an ever-more demanding consumer. Executive changes include appointing Dennis Organ as chief operating officer, U.S. operations, and Russ Dokken as executive vice president of U.S. packaged meats. The shake-up will help the US$15 billion company focus on higher-margin consumer packaged foods as commodity markets remain volatile. "If we think we are just going to sit here and make the same old bacon, sausage and ham and say ‘That’s how we are going to live and grow,’ that’s not going to work," Chief Executive Officer Ken Sullivan said in an interview at the company’s headquarters in Smithfield, Virginia. "We’ve got to be thinking more broadly in terms of the consumer and our customers." Commodity companies have struggled to boost profits as changing tastes and a fast-paced lifestyle mean consumers prefer specialty items and easy-to-cook meals. That’s pushed the likes of Smithfield and rival Tyson Foods Inc. to focus on value-added products such as sliced ham and marinated pork chops. Organ was previously senior vice president of supply chain and took his new post as of Jan. 1, according to the company. He and Dokken will focus on growing the packaged foods business -- which often accounts for more than three-quarters of profits -- and bringing together the company’s many brands under one umbrella, while keeping its meat legacy. "We are an animal-protein company, and I don’t run from that," Sullivan said. "That said, in the commodity end of the business, it’s harder to differentiate yourself and therefore harder to have a better margin profile. That’s why we focused in the packaged-end part of the business. The more value you can add the more consumers are willing to pay." Smithfield was founded in the 1930s and expanded rapidly from a business worth "couple of hundred million dollars" in the early 1980s to a multinational now, Sullivan said. The company had a wildly successful past, Sullivan said, gobbling up market share through acquisitions in the 1980s, 1990s and early 2000s, and its share price soared in a way that was disconnected to fundamentals -- similar to technology companies with out-sized valuations today. But Smithfield kept the acquisitions as independent companies that competed against one another. "Imagine a world in which a big retailer like Walmart, or whoever you want to use, calls up Smithfield and says we want you to supply either our fresh pork business or our bacon business," Sullivan said. "We would receive that phone call and maybe five different sales teams would show up." While the company didn’t consolidate its operations, its stock price was performing well, and that was the measure of success, he said. From the mid-2000s, things started to change. 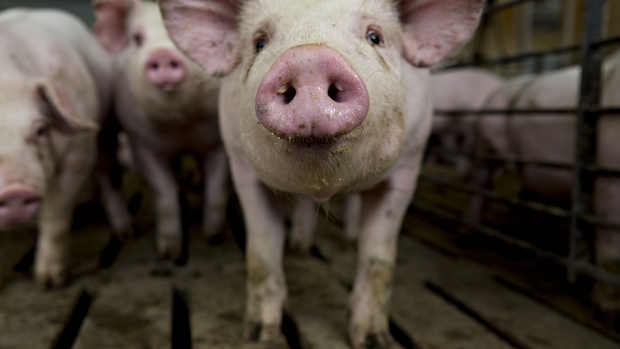 Smithfield had grown so much that competition became a barrier to acquisitions and the emergence of ethanol boosted corn prices, which accounts for 60 per cent to 70 per cent of the cost of raising hogs. Integrating Smithfield’s brands into one company is a job that started with the back office in 2015. With computer systems now aligned, it can focus on everything from simplifying manufacturing processes to breaking silos between units, while catering to changing consumers tastes and habits. Pork that’s increasingly ready to eat will also drive growth, along with other value-added products. Smithfield is slicing bacon thicker, peppering and flavoring it, and demand for bacon bits is rising. Hams are sold already sliced, portioned and julienned. Dry sausages are pre-diced. Smithfield, acquired in 2013 by Hong Kong-listed WH Group, is expanding its international business. It already has subsidiaries in Poland and Romania and joint ventures in Mexico. It’s also growing in chicken and building a new poultry plant in Poland, Sullivan said. "That end of our business we like," he said. "We’ve got that to a point that it will be increasingly a profit contributor to Smithfield and we have been growing on a volume basis very nicely, seeing double-digit growth in some categories, which is really hard to do in the U.S."
Smithfield is in the process of deciding how much capital it will invest in each part of the business next year. It plans to favor renovating plants and growing internally over acquisitions. 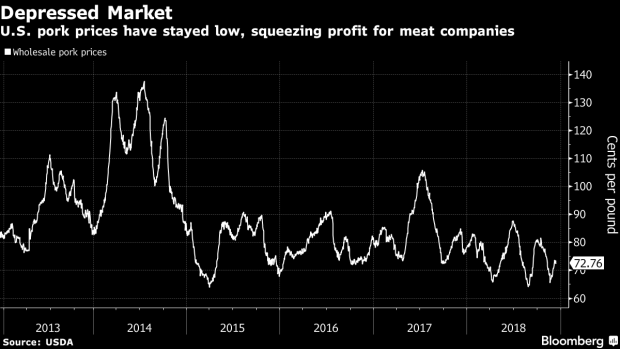 "When I look at some of the multiples that are out there, I think our best investment is actually Smithfield Foods," Sullivan said. Gregg Schmidt will remain president of U.S. hog production until his retirement at the end of 2019. Brady Stewart will succeed him. John Pauley named to newly created position of chief commercial officer, packaged meats. Keira Lombardo named executive vice president of corporate affairs and compliance. --With assistance from James Attwood.